Medicine in ancient Rome combined various techniques using different tools, methodology, and ingredients. Roman medicine was highly influenced by Greek medicine. Greek physicians including Dioscorides and Galen practiced medicine and recorded their discoveries in the Roman Empire. These two physicians had knowledge of hundreds of herbal, among other, medicines. Ancient Roman medicine was divided into specializations such as ophthalmology and urology. A variety of surgical procedures were carried out using many different instruments including forceps, scalpels and catheters. The Roman Empire was a complex and vigorous combination of Greek and Roman cultural elements forged through centuries of contact. Later Latin authors, notably Cato and Pliny, believed in a specifically Roman type of healing based on herbs, chants, prayers and charms easily available to any head of household. Greek medicine was introduced into Italy with the establishment and development of military and political contacts between the two regions. But it was not until the introduction of the healing god Asclepius in 291 BC and the arrival of the Greek doctor Archagathus in 219 BC that foreign medicine was publicly accepted in Rome. Setting aside some of the broader implications of the Greek influence on Roman society, the effect of Greek medicine, ethnography, and meteorology was particularly pertinent to two fields: architecture and health care. This was particularly important from the perspective of the Roman army, in which there were many medical advances. A medical corpus was established, permanent physicians were appointed, the valetudinaria (military hospitals) were established, and in Caesar's time, the first traces of systematic care for the wounded appeared. The variety and nature of the surgical instruments discovered in Roman remains indicate a good knowledge of surgery. Roman medicine was highly influenced by the Greek medical tradition. The incorporation of Greek medicine into Roman society allowed Rome to transform into a monumental[clarification needed] city by 100 BCE. Like Greek physicians, Roman physicians relied on naturalistic observations rather than on spiritual rituals; but that does not imply an absence of spiritual belief. Tragic famines and plagues were often attributed to divine punishment; and appeasement of the gods through rituals was believed to alleviate such events. Miasma was perceived to be the root cause of many diseases, whether caused by famine, wars, or plague. The concept of contagion was formulated, resulting in practices of quarantine and improved sanitation. One of the first prominent doctors in Rome was Galen. He became an expert on the human anatomy by dissecting animals, including monkeys, in Greece. Due to his prominence and expertise in ancient Rome, Galen became Emperor Marcus Aurelius' personal physician. The Romans also conquered the city of Alexandria, which was an important center for learning; its Great Library held countless volumes of ancient Greek medical information. The Romans adopted into their medical practices many of the practices and procedures they found in the Great Library. Greek symbols and gods greatly influenced ancient Roman medicine. The caduceus, pictured right, was originally associated with Hermes, the Greek god of commerce. He carried a staff wrapped with two snakes, known as the caduceus. This symbol later became associated with the Roman God, Mercury. Later, in the 7th century, the caduceus became associated with health and medicine due to its association with the Azoth, the alchemical "universal solvent". Cato the Elder despised every aspect of Greek society the Romans decided to mimic including sculptures, literature and medicine. Cato regarded the welcome given in Rome to Greek medicine and physicians as a major threat. In Rome, before there were doctors, the paterfamilias (head of the family) was responsible for treating the sick. Cato the Elder himself examined those who lived near him, often prescribing cabbage as a treatment for many ailments ranging from constipation to deafness. He would issue precise instructions on how to prepare the cabbage for patients with specific ailments. He also used cabbage in liquid form. For example, a mixture of cabbage, water, and wine would be embedded in a deaf man's ear to allow his hearing to be restored. Cato would treat fractured or broken appendages with two ends of a cut reed that were bandaged around the injury. Many Greek doctors came to Rome. Many of them strongly believed in achieving the right balance of the four humors and restoring the natural heat of patients. Around 200 BCE many wealthy families in Rome had personal Greek physicians. By around 50 BCE, it was more common than not to have a Greek physician. Pedanius Dioscorides (c. 40–90 CE), was a Greek botanist, pharmacologist and physician who practised in Rome during the reign of Nero. He became a famous army doctor. Dioscorides wrote a 5-volume encyclopedia, De Materia Medica, which listed over 600 herbal cures, forming an influential and long-lasting pharmacopoeia. De Materia Medica was used extensively by doctors for the following 1500 years. Soranus was a Greek physician, born in Ephesus, who lived during the reigns of Trajan and Hadrian (98–138 CE). According to the Suda, he practised in Alexandria and subsequently in Rome. He was the chief representative of the Methodic school of physicians. His treatise Gynaecology is extant (first published in 1838, later by V. Rose, in 1882, with a 6th-century Latin translation by Muscio, a physician of the same school). Galen (129 CE – c. 200 or 216 CE) of Pergamon was a prominent Greek physician, whose theories dominated Western medical science for well over a millennium. By the age of 20, he had served for four years in the local temple as a therapeutes ("attendant" or "associate") of the god Asclepius. Although Galen studied the human body, dissection of human corpses was against Roman law, so instead he used pigs, apes, and other animals. Galen moved to Rome in 162. There he lectured, wrote extensively, and performed public demonstrations of his anatomical knowledge. He soon gained a reputation as an experienced physician, attracting to his practice a large number of patients. Among them was the consul Flavius Boethius, who introduced him to the imperial court, where he became a physician to Emperor Marcus Aurelius. Despite being a member of the court, Galen reputedly shunned Latin, preferring to speak and write in his native Greek, a tongue that was actually quite popular in Rome. He treated Roman luminaries such as Lucius Verus, Commodus, and Septimius Severus. In 166 Galen returned to Pergamon, but went back to Rome for good in 169. Galen followed Hippocrates' theory of the four humours, believing that one's health depended on the balance between the four main fluids of the body (blood, yellow bile, black bile and phlegm). Food was believed to be the initial object that allowed the stabilization of these humours. By contrast, drugs, venesection, cautery and surgery were drastic and were to be used only when diet could no longer help. The survival and amendment of Hippocratic medicine is attributed to Galen. He writes that a physician "must be skilled at reasoning about the problems presented to him, must understand the nature and function of the body within the physician world[clarification needed] and must "practice temperance and despise all money". The ideal physician treats both the poor and elite fairly and is a student of all that affects health. Galen references Hippocrates throughout his writings, saying that Hippocratic literature is the basis for physicians' conduct and treatments. The writings of Galen survived more[clarification needed] than other medical writings in antiquity. Asclepiades studied to be a physician in Alexandria and practiced medicine in Asia Minor as well as Greece before he moved to Rome in the 1st century BCE. His knowledge of medicine allowed him to flourish as a physician. Asclepiades was a leading physician in Rome and was a close friend of Cicero. He developed his own version of the molecular structure of the human body. Asclepiades' atomic model contained multi-shaped atoms that passed through bodily pores. The two were required to be in sync[clarification needed] in order to avoid disease. Asclepiades strongly believed in hot and cold baths as a remedy for illness; his techniques purposely did not inflict severe pain upon the patient. His other remedies included: listening to music to induce sedation, and consuming wine to cure headache and to cure a fever. Asclepiades is the first documented physician in Rome to use massage therapy. The Roman medical system saw the establishment of the first hospitals; these were reserved for slaves and soldiers. Physicians were assigned to follow armies or ships, tending to the injured. Medical care for the poor was almost non-existent, so the poor had to resort to spiritual aid. The earliest known Roman hospitals of the Roman Empire were built in the 1st and 2nd centuries AD, in the reign of the emperor Trajan. The army's expansion beyond the Italian Peninsula meant that the wounded could no longer be cared for in private homes.[why?] For this reason the valetudinarium was established. The valetudinaria (plural of valetudinarium) were field hospitals or flying military camps and began as a small cluster of tents and fortresses dedicated to wounded soldiers. Over time, the temporary forts developed into permanent facilities. The original hospitals were built along major roads, and soon became part of Roman fort architecture. They were usually placed near the outer wall in a quiet part of the fortification. 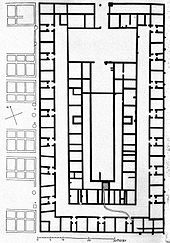 A standard valetudinarium was a rectangular building consisting of four wings, connected by an entrance hall that could be used as a triage center. Each legion's hospital was constructed to accommodate 6% to 10% of the legion's 5,000 men. The building also included a large hall, reception ward, dispensary, kitchen, staff quarters, and washing and latrine facilities. Roman surgical instruments found at Pompeii. Roman surgical instruments; from the "Surgeon's House" in Ariminum (Rimini, Italy). An instrument mentioned by Hippocrates, which allowed physicians to examine the rectal cavity of a patient. A tool used to leverage bones back into their proper place in a limb. Containers used for bloodletting. Vessels of different sizes were used depending on how much blood was expected. After surgery, a bronze or lead tube would be inserted into the patient to prevent adhesion or contractions. A physician's "bread and butter" tool. This instrument was used for several purposes, such as stopping bleeding, cutting flesh or removing growths. Hair cutting was actually considered a medical procedure. A double sided instrument used by almost every physician. One end was used for mixing medications, while the other end was flat and used to spread the medications onto the patient. Could be made of either steel or bronze. Ancient scalpels had almost the same form and function as those of today. The most usual type of scalpels were the longer, steel scalpels. These could be used to make a variety of incisions, but they seem to be particularly suited for deep or long cuts. Smaller, bronze scalpels, referred to as bellied scalpels, were also used frequently since the shape allowed delicate and precise cuts to be made. A common instrument used by Roman and Greek doctors. There were two basic types of hooks: sharp hooks and blunt hooks. Blunt hooks were used primarily as probes for dissection and for raising blood vessels. Sharp hooks, on the other hand, were used to hold and lift small pieces of tissue so that they could be extracted, and to retract the edges of wounds. Driven in their rotary motion by means of a thong in various configurations. They were used to remove diseased bone tissue from the skull and to remove foreign objects (such as a weapon) from a bone. Used to extract small fragments of bone which could not be grasped by the fingers. Used in order to open up a blocked urinary tract to let urine pass freely from the body. Early catheters were hollow tubes made of steel or bronze, and had two basic designs. There were catheters with a slight S curve for male patients and a straighter one for females. There were similar shaped devices called bladder sounds that were used to probe the bladder in search of calcifications. These finely toothed jawed forceps were designed for the amputation of the uvula. The physician crushed the uvula with forceps before cutting it off in order to reduce bleeding. Among the most complex instruments used by Roman and Greek physicians. Most of the vaginal specula discovered consist of a screw device which, when turned, forces a cross-bar to push the blades outwards. Used to mix and apply various ointments. Used to cut through bones, e.g. in amputations. Correct diet was seen as essential to healthy living. Food was perceived to have a healing effect or a causative effect on disease, determined by its impact on the humors; as well as preventing disease. Moderation of foods was key to healthy living and gave rise to healthy eating philosophies. When diet no longer promoted health, drugs, phlebotomy, cautery, or surgery were used. Patients having control of their lives, managing their own preventative medical diets, and the freedom to seek physicians, indicates that patient autonomy was valued. Statues and healing shrines were sites of prayer and sacrifice for both the poor and the elite, and were common throughout the Roman Empire. Reverence for shrines and statues reflected a search for healing, guidance, and alternatives to ineffectual human physicians and drugs. In 2013, Italian scientists studied the content of a Roman shipping vessel, known as the Relitto del Pozzino, sank off the coast of Populonia, Tuscany around 120 BC, which was excavated during the 1980s and 90s. The vessel had a medicine chest with pyxides inside, which contained medicinal tablets or pills full of a number of zinc compounds, as well as iron oxide, starch, beeswax, pine resin and other plant-derived materials, all probably served as some sort of eye medicine or eyewash. A physician's overall goal was to help those afflicted by disease or injury as best as they could; the physician's credibility rested on their successful cures. Of course they could not reliably cure ailments; sometimes the best they could hope for was that their treatments did not worsen their patients' problems. Many physicians were criticised by their peers for their inability to cure an apparently simple illness. Gaps in physician-provided care were filled with several types of supernatural healthcare; the Romans believed in the power of divine messages and healing. There have been descriptions of many gods from multiple religions that dealt with destruction or healing. Scattered across Greco-Roman and Egyptian history are descriptions of healing sanctuaries dedicated to the various healing gods. Sick or injured Romans would often flock to temples dedicated to Asclepius, the god of healing, as it was believed that the god actually inhabited the sanctuary and would provide divine healing to supplicants. The process itself was simple: the sick person would give a specified donation to the temple, and then undergo a process called "incubation" in which they would relocate to a special room where the god would be able to contact them, often through dreams in which the god would either prescribe care or provide it themselves. Often the type of cure prescribed would be rather similar to the actual medical practices of physicians of the time. This type of supernatural care did not conflict with mainstream healthcare. Physicians would often recommend that patients go to a healing sanctuary when they were afflicted by an illness that the physician could not cure. This allowed the reputation of the physician to remain unharmed, as it was seen more as a referral than as a failure. It has been shown in modern times that having patients ingest mother's milk (or colostrum) is actually a rather effective treatment. Colostrum has been shown to prevent the growth of Staphylococcus bacteria, which are a known cause of several types of infection. Colostrum is about half as effective as some antibiotics prescribed to patients today. Colostrum is also effective against the bacterium chlamydia; this is the cause of a sexually transmitted disease and also can cause severe sight impairment, if not blindness. Thus, colostrum was a rather effective treatment in the ancient world – perhaps that is why it was viewed as a divine treatment. The interpretation of dreams was another avenue for treatment of illnesses by physicians. Often the interpretations of a patient's dreams would actually determine what treatment they received. A Hippocratic work called Regimen details much of the principles outlined by Galen: specifically the humors and examples of how they could be used to prescribe treatment. The theme of this method is knowing the patient. To know how to treat a person, the physician must become familiar with and interpret the important aspects of their lives: the climate, their food intake, how much they sleep, how much they drink, any injuries. They would then draw conclusions about the patient and what must be done to set them back to equilibrium. The fourth book of the Regimen is the earliest mention of the topic of dream medicine. Dreams were used by physicians in diagnosis. They added another layer of depth to the physician's investigation of the patient. The soul was thought to serve the purpose that the brain has been discovered to serve. Sensation, pain, motion and other physiological concepts were thought to be the work of the soul. It was also thought that the soul continues the work of bodily upkeep even when a person is sleeping. Thus, dreams would show what ailed a person. There were two types of dreams associated with medicine: prophetic and diagnostic. Prophetic dreams were divine in origin and foretold good or bad tidings for the future. Diagnostic dreams were a result of the soul telling what afflicted the body. If the dreams were of normal everyday events, their body was healthy and in equilibrium. The farther from the norm, and the more chaotic the dreams were, the more ill the patient was. The treatments that were recommended addressed what the dreams showed, and attempted to set the body right through consumption of food that carried the correct humor characteristics. Galenic medical texts embody the written medical tradition of classical antiquity. Little written word has survived from before that era. The volume of Galen's extant written works, however, is nearly 350 – far surpassing any other writer of the period. Prior to Galen, much of medical knowledge survived through word of mouth. The tradition of transmission and translation originated with the De Materia Medica, an encyclopedia written by Pedanius Dioscorides between 50 AD and 70 AD. Dioscorides was a Roman physician of Greek descent. The manuscripts classified and illustrated over 1000 substances and their uses. De Materia Medica influenced medical knowledge for centuries, due to its dissemination and translation into Greek, Arabic, and Latin. Galen wrote in Greek, but Arabic and Syriac translations survived as well. He referenced and challenged written works by Hippocratic physicians and authors, which gave insight into other popular medical philosophies. Herophilus, known for his texts on anatomy through dissection, and Erasistratus, also known for anatomy and physiology, survive through Galenic reference. Galen also referenced the written works of Methodist[clarification needed] physician Soranus, known for his four-book treatise on gynecology. His synthesis of earlier medical philosophies and broad range of subjects produced the textual legacy that Galen left for the medical community for the next 1500 years. ^ Magner, Lois N. (1992-03-17). A History of Medicine. CRC Press. pp. 80–90. ISBN 9780824786731. ^ Conrad, Lawrence 1 (2009). The Western medical tradition. : 800 BC to AD 1800. Cambridge: Cambridge Univ. Press. pp. 33–58. ISBN 9780521475648. ^ Grmek, Mirko D.; Fantini, Bernardino; Shugaar, Antony (2002-05-01). Western Medical Thought from Antiquity to the Middle Ages. Harvard University Press. pp. 111–120. ISBN 9780674007956. ^ Conrad, Lawrence I.; Medicine, Wellcome Institute for the History of (1995-08-17). The Western Medical Tradition: 800 BC to AD 1800. Cambridge University Press. pp. 39–45. ISBN 9780521475648. ^ a b Israelowich, Ido (2015-01-23). Patients and Healers in the High Roman Empire. JHU Press. pp. 90–100. ISBN 9781421416281. ^ Byrne, Eugene Hugh (Apr 1910). "Medicine in the Roman Army". The Classical Journal. The Classical Association of the Middle West and South. JSTOR 3286964. ^ a b Nutton, Vivian (2009). Ancient medicine. London: Routledge. pp. 166–167. ISBN 978-0-415-36848-3. ^ Conrad, Lawrence I. (1998). The Western medical tradition, 800 BC to AD 1800 (Reprinted. ed.). Cambridge: Cambridge University Press. pp. 53–54. ISBN 0521475643. ^ a b "What Is Ancient Roman Medicine?". www.medicalnewstoday.com. Retrieved 2015-11-18. ^ "Hermes". www.greekmythology.com. Retrieved 2015-11-30. ^ a b “Household Medicine In Ancient Rome.” The British Medical Journal, vol. 1, no. 2140, 1902, pp. 39–40. ^ "Greek Medicine". National Institutes of Health, USA. 16 September 2002. Retrieved 29 August 2014. ^ Chisholm, Hugh, ed. (1911). "Medicine" . Encyclopædia Britannica. 18 (11th ed.). Cambridge University Press. p. 44. ^ "Galen". Encyclopædia Britannica. IV. Encyclopædia Britannica, Inc. 1984. p. 385. ^ Galen (2000). Galen: on food and diet. Translator: Grant, Mark. London and New York: Routledge. pp. 5–7. ISBN 0415232325. ^ Jonsen, Albert R. (2000). A short history of medical ethics. Oxford University Press. p. 10. ^ Conrad, Lawrence I. The Western medical tradition, 800 BC to AD 1800. p. 60. ISBN 0521475643. ^ a b c “A Fashionable Physician Of Ancient Rome.” The British Medical Journal, vol. 2, no. 1763, 1894, pp. 820–820. ^ a b McCallum, Jack Edward (2008-01-01). Military Medicine: From Ancient Times to the 21st Century. ABC-CLIO. pp. 15–16. ISBN 9781851096930. ^ a b Byrne, Eugene Hugh (1910-04-01). "Medicine in the Roman Army". The Classical Journal. 5 (6): 267–272. JSTOR 3286964. ^ a b Gabriel, Richard A. (2012-01-01). Man and Wound in the Ancient World: A History of Military Medicine from Sumer to the Fall of Constantinople. Potomac Books, Inc. pp. 168–173. ISBN 9781597978484. ^ Retief, F. P.; Cilliers, L. (2006-01-01). "The evolution of hospitals from antiquity to the Renaissance". Acta Theologica. 26 (2): 213–232. doi:10.4314/actat.v26i2.52575. ISSN 1015-8758. ^ Gabriel, Richard A. (2007-01-01). The Ancient World. Greenwood Publishing Group. pp. 156–157. ISBN 9780313333484. 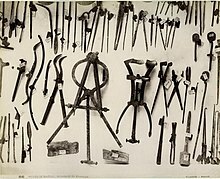 ^ a b c d e f g h i "Surgical Instruments from Ancient Rome". University of Virginia Claude Moore Health Services Library. 2007. Retrieved 16 September 2014. ^ Grant, Mark (2000). Galen on food and diet. London: Routledge. pp. 6–7. ISBN 0-415-23232-5. ^ Conrad, Lawrence I. The Western medical tradition, 800 BC to AD 1800. pp. 47–52. ISBN 0521475643. ^ "What's Inside a 2,000-Year-Old, Shipwreck-Preserved Roman Pill?". Smithsonianmag.com. 7 January 2013. ^ "Scientists Learn Ingredients of 2,000-Year-Old Roman Pills Found in Ancient Shipwreck". Ancient Origins. 9 July 2017. ^ Scarborough, John (1997-02-01). On the Understanding of Medicine Among the Romans. The Historian. pp. 459–464. JSTOR 24444508. ^ Holowchak, Andrew (2001-10-01). Interpreting Dreams for Corrective Regimen. Journal of the History of Medicine and Allied Sciences. pp. 382–399. JSTOR 24623949. ^ Laskaris, Julie (2008). Nursing Mothers in Greek and Roman Medicine. American Journal of Archaeology. pp. 459–464. JSTOR 20627484. ^ VM, Avery (1991). Antibacterial Properties of Breast Milk. US Library of medicine. pp. 1034–1039. PMID 1802694. ^ Bliquez, Lawrence (1981-04-01). Greek and Roman Medicine. Archaeology. pp. 10–17. JSTOR 41727119. ^ "BBC - GCSE Bitesize: Overview". Retrieved 2015-12-08. ^ King, Helen (2002). Greek and Roman medicine. London: Bristol Classical. p. 38. ISBN 978-1-85399-545-3. ^ Nutton, Vivian (2009). The Western medical tradition: 800 BC to AD 1800. Cambridge: Cambridge Univ. Press. ISBN 978-0-521-47564-8. ^ Nutton, Vivian (2009). Ancient medicine. London: Routledge. p. 201.ISBN 978-0-415-36848-3. ^ Jackson, Ralph (1988). Doctors and diseases in the Roman Empire. Norman: University of Oklahoma Press. pp. 60–61. ISBN 978-0-8061-2167-3. Osbaldeston, Tess Anne (translator) (2000). Dioscorides. Johannesburg: Ibidis Press. Archived from the original on 2014-09-24. Dean-Jones, David E. (1993). Galen On the Constitution of the Art of Medicine: Introduction, Translation, and Commentary. University of Texas, Austin. Dissertation. Brodersen, Kai (2015). Plinius' Kleine Reiseapotheke (Medicina Plinii, Latin and German). Stuttgart: Franz-Steiner-Verlag. ISBN 978-3-515-11026-6. C N Trueman (17 March 2015). "Medicine In Ancient Rome". historylearningsite.co.uk. The History Learning Site. Retrieved 3 December 2015. Nordqvist, Christian (9 August 2012). "What Is Ancient Roman Medicine?". Medical News Today. MediLexicon International Ltd. Retrieved 3 December 2015. Rymer, Eric. Medicine and Health in Ancient Rome. History Link 101. History Source LLC. Retrieved 3 December 2015. Scarborough, John (1996). Drugs and Medicine in the Roman World (PDF). University of Pennsylvania. Retrieved 3 December 2015.